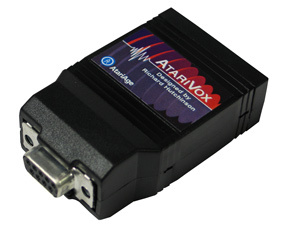 The AtariVox is a voice synthesizer/memory card for the Atari 2600. 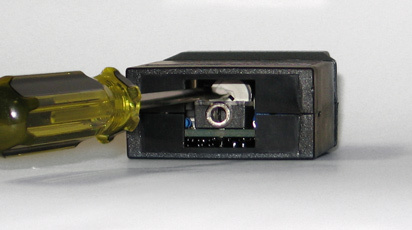 The audio output from the AtariVox is a 1/8" mini-plug. If you want to be able to hear the AtariVox, you either need to plug it into some speakers, or tie it into the audio in your TV. If you've got a 2600 with an audio/video mod, you can build a simple mixing circuit to combine the audio from your AtariVox with that of your 2600. If you don't add the circuit, you won't get both audio signals. This is for stereo, so the top and bottom diagrams are the same. If you're working with mono audio, you only need to build half of it. 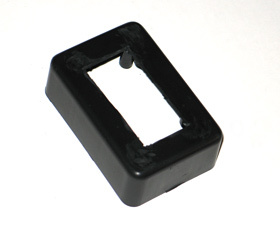 Parts can be found at Radio Shack (one of the few useful things left to buy there). For stereo, you'll need four 10K ohm resistors. They come in a pack of five for 99 cents. 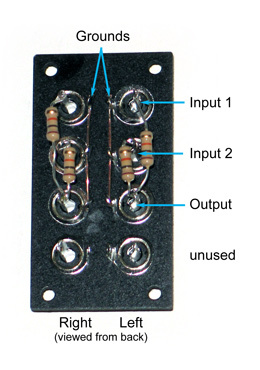 You could make this circuit just by cutting up a few RCA cables, and wiring the resistors directly in-line. 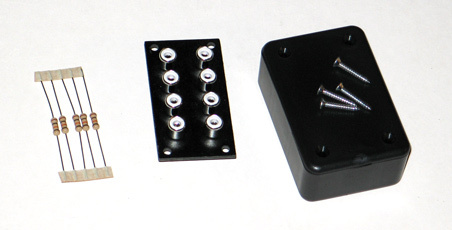 But if you want a little cleaner look, you can buy a 3" x 2" x 1" project box ($2.29) and a Phono Jack Board ($3.99 - which is cheaper than buying six individual RCA jacks). Then I wired a 10K ohm resistor on the center (positive) connection of each input, and tied those to the center connection on the output. Next, I used a spare piece of wire to tie all of the shield (ground) connections together. No circuit board required - the resistor leads are more than long enough. 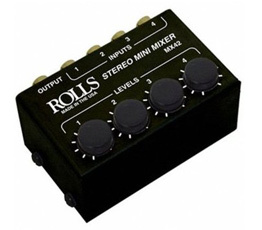 If you're making a stereo mixer, be sure to keep the left and right connections separated. Be sure to label the box, before attaching the lid. I used some small screws I had laying around to secure the jack panel in place. 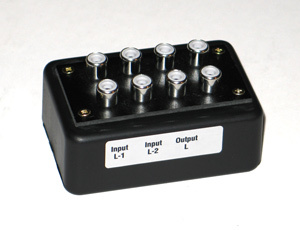 The reason this works without needing potentiometers, is that the AtariVox has a built-in volume control. So you can use that to set a good balance between the AtariVox and the 2600. Of course, if you wanted a more professional-looking setup, you can always buy one of these. But it's basically the same thing. With knobs.